Are you sitting at home, desperately wanting and praying for more of “The Avengers”? Of course you are, how could you not be? Well your prayers have been answered… Sort of. 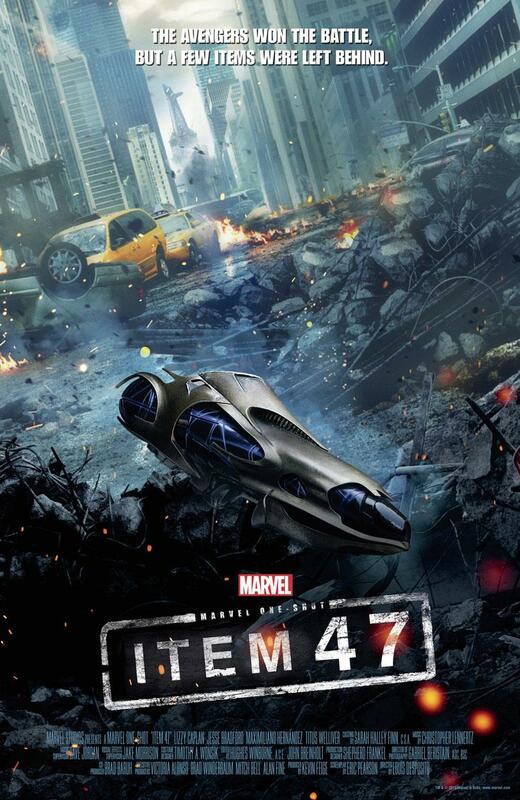 Marvel has just revealed the poster for a short entitled “Item 47”. The story picks up after the events that concluded “The Avengers” which *SPOILER ALERT* left New York smashed to bits. The One-shot (it is known as such because in the comic book industry a “One-Shot” is a story that will wrap itself up in a single issue) begins when a couple stumble upon an alien device left behind after the battle that was fought on the streets of New York between The Avengers and Loki’s army. The two decide to use it to their advantage and go on a crime spree, and it is up to S.H.I.E.L.D to find them and retrieve “Item 47” before more harm can be done. The One-Shot stars Lizzy Caplan (Mean Girls, Party Down) and Jesse Bradford (Flags of Our Fathers, Bring it On) as the “Bonnie and Clyde-esque” couple. The two S.H.I.E.L.D agents will be Maximiliano Hernandez, who has been featured in both “Thor” as well as “The Avengers”, and Titus Welliver (The Smoke Monster!) in his Marvel debut. “Item 47” will be a step in what may be a jumping off point for some of Marvel’s lesser known heroes and villains. Marvel will begin to use these One-Shots to determine whether or not there is an audience for characters such as Black Panther and Wasp, and may lead to them getting their own feature-length films down the road. And considering that Edgar Wright has already shot test footage for what may become an Ant Man film or short, it is only more awesome Marvel goodness for us fans. So I’m sure by now you’re asking/screaming at your computer, “How can I see this awesome thing your are describing with words! ?” Well, you have one of two ways. 1) For those of you lucky enough to be attending this years Comic Con in San Diego, you will be pleased to know that you can be the first to see “Item 47”! But don’t think it’ll be so simple. You will have to partake in a scavenger hunt that will give you clues to the whereabouts of the secret screening. Go luck to you all… and let me know how it is! 2) For those of us NOT lucky enough to be attending this years Comic Con in San Diego, you will be pleased to know that you can also see “Item 47”! But not for awhile. The One-Shot will be made available on the ultra-uber-special-DVD-Blu Ray edition of “The Avengers”. So you will certainly be able to see it then. ~ by Brandon Gnuschke on July 11, 2012.